1. Preheat the oven to 180°C, gas mark 4. To make the breadsticks, place the flour, salt, sugar and yeast in a bowl. Gently rub in the butter until the mixture resembles breadcrumbs. Add the rosemary and the milk, then tip out and kneed for about 10 minutes until a soft dough forms. Place into a lightly oiled bowl and leave to rise for 1 hour. 2. Tip the dough out of the bowl and, without the use of flour, roll into a 1cm thick rectangle approx 30cmx20cm. Cut into about 30 strips 1cmx20cm long, then roll into pencil shapes. 3. Lay the dough sticks onto baking sheets sprinkled with polenta and bake in the oven for 15-20 minutes until golden. 4. For the tapenade, drain the olives and rinse under cold water, then tip into a food processor. Add the garlic, capers, basil, walnuts and tomatoes, and blitz to a very course paste. Add the oil and lemon and blitz again to give a textured paste. 5. 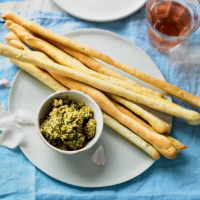 Serve the breadsticks warm with the olive tapenade.